Being able to complete the Hawkins Horseshoe was the centrepiece of our trip to Waterton Lakes National Park. During the research and planning phase, I was inspired by Bob Spirko’s description of the route, and felt that I had enough information in hand to tackle this as my first true scramble experience. Bob also posted a Google Earth KML file which I then be converted and imported directly into my Garmin GPS for reference purposes during the outing using GPS Babel (a free a GPS utility). It helped that I had been an active member of the Alpine Club for 6 years, and had developed the navigation skills necessary for such an outing. I also had prior experience hiking in Lake O’Hara, as well as on the Berg Lake Trail and in the Olympic mountains in Washington State. So I wasn’t a total newbie on this outing, however, being from Eastern Canada, I certainly did not have the experience of some of the more accomplished scramblers. With that said, this is not an outing for complete beginners.I had organized this as an Alpine Club outing, and had a few takers to join me on the trip. A potential participant was not able to join our group, but had been on the ridges found within the park in the past and guaranteed me that we would fall in love with them (and she was right!). We left our vehicle at the Rowe Lakes trailhead and covered the 1.4 km road walk to the Lineham Lakes trailhead within 15 minutes to get our trek formally under way. It was around 7:45 am by the time that we were in position to properly start the circuit. The trail meanders through a wooded area before reaching open meadows, and our first views our our principle target: Mt Blakiston. About 3 1/2 kms out from the trailhead, we took our first break at the base of a gully that would be our main route up to the summit. Mt. Blakiston is the highest peak in the park at 2,910 metres. Looking straight up toward the summit, we knew that we would have our work cut out for us. The grade was quite steep as we would be gaining over a 1,000m in elevation over a distance of about 2.3 kms. We found ourselves leaning forward many a time in order to maintain our balance on the way up, and leaning backward when we stopped and sat for a break to take in views of Mt. Lineham and the Lineham Lakes. The scree rock that covers almost all of this landscape looks and sounds like broken shale and crunches under foot. I also learned that it is very sharp – abrasive to the point where the skin on my finger tips was peeling for several days after the outing. It took us about 6 1/2 hours to reach our lunch spot – a beautiful ledge just 300′ from the summit, with unobstructed views all around. We were finally on the summit at about 2:15pm, and savoured the achievement for about 15 minutes before deciding to push on and start the actual ridge walk. We had beautiful blue skies, light winds, and temperatures in the 20° C range on this day. When you consider that this trip was planned a full 10 months ahead of time, we could not have been any luckier with the weather! Apart from a tricky bet just west of Mt. Hawkins, the route is fairly straightforward: simply connect the dots between the summits of Mt. Blakiston, Mt. Hawkins and Mt. Lineham and the ridge will take you there! 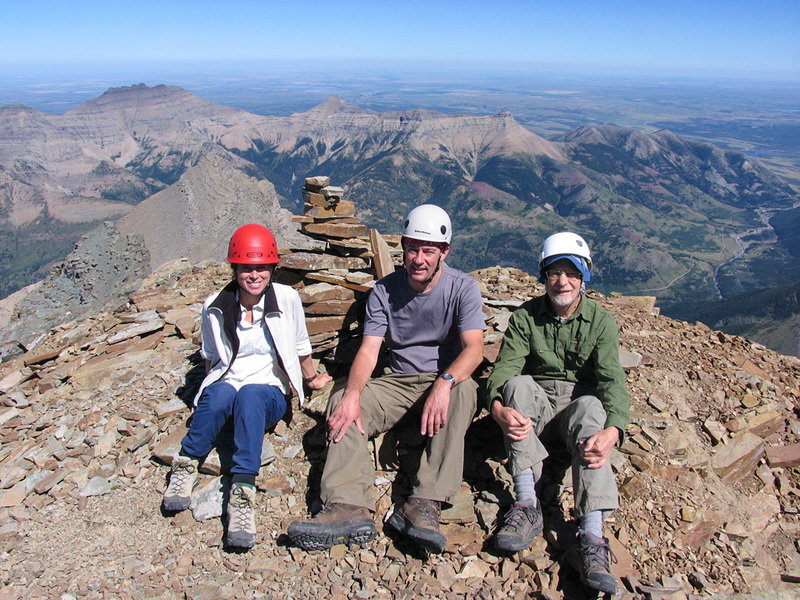 Bob Spirko’s blog is a testament to the number of outings he had done at altitude. He managed to bag all 3 peaks in under 10 hours (I suspect that he lives in Calgary and is within striking distance of some of the greatest outings on Earth). With half that time being required to summit Blakiston, it might not be a surprise that our outing took us about 13 hours to complete, and we had to cut the trip short compared to Bob’s route by skipping out on Mt. Lineham and descending into the Rowe Lakes Basin using the main trail down toward the bowl (this was shortly after making a bad choice at a marked fork in the trail – we chose right when in fact we should have stayed left – costing us 500m and a needles slog to make up for lost elevation). You can read about more outings on this trip here. Bob Spirko’s blog post on the Hawkins Horseshoe can be found here.